Sir James Matthew Barrie (1860-1937) was born in Scotland and later moved to London, where he wrote numerous plays and novels. Barrie was the ninth of ten children and his father worked as a weaver. Barrie married actress, Mary Ansell, in 1894, and the couple had a Saint Bernard dog named Porthos, but no children. The couple later divorced in 1909. 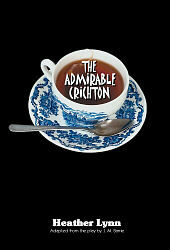 In 1902, Barrie wrote The Admirable Crichton, a comedy that humorously explores the controversial issue of English class divisions. The character of the cheerful, egotistical Ernest Woolley, is thought to be a caricature of the main character in Oscar Wilde’s play, The Importance of Being Earnest. Today, Barrie is best known for his 1928 play Peter Pan.